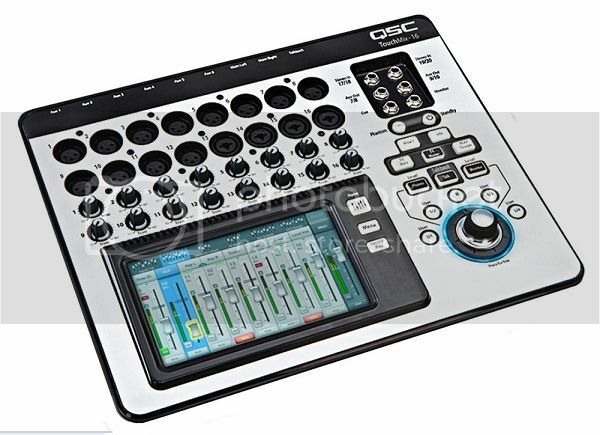 The QSC TouchMix compact mixer series caught my attention from the moment it was introduced. The control surface is without physical faders – inputs and adjustments are accomplished via the large (6.1 x 3.5 inch) color TFT touch screen and rotary knob on the surface, or wirelessly via a tablet running the TouchMix app. And it's been designed to meet the needs of both novice and experienced users. The company recently sent me the 16-channel model, appropriately named the TouchMix-16, for evaluation. The smaller TouchMix-8 offers 8 channels, and both units are very similar in terms of feature sets, including a library of channel presets as well as onboard effects and gain wizards that help less experienced operators focus on the mix, not the mixer. 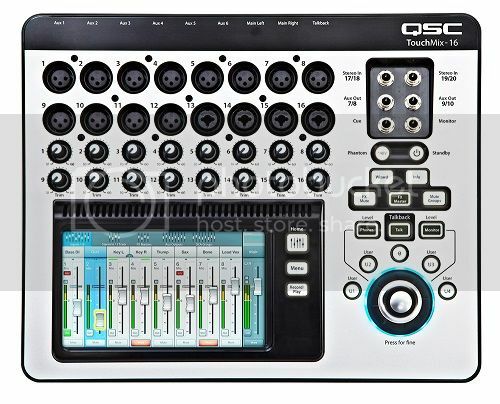 Multi-track recording is as simple as connecting a USB hard drive to one of the USB ports, and all inputs plus a stereo mix (22 tracks total) can be recorded as wave files. TouchMix can be used as a mix-down desk or the tracks can be imported into a DAW. 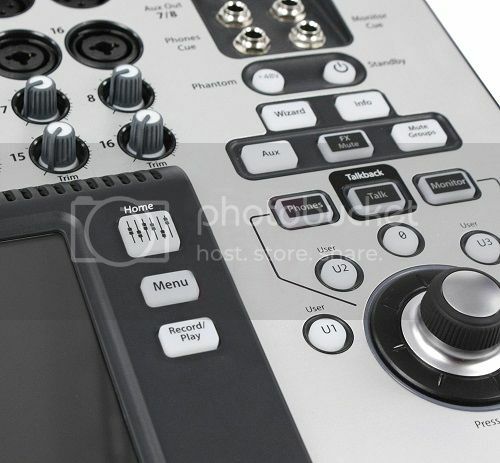 Users can also save the channel presets or complete mixer scenes to internal memory or a USB device. The TouchMix-16 provides 20 full-function inputs with 12 XLR inputs, 4 XLR/TRS combo inputs, 2 stereo line TRS inputs, and a talkback microphone input with XLR. Outputs include 6 aux XLRs, 2 stereo TRS (that can drive wired in-ear monitors directly), main L/R XLRs, cue TRS and a headphone jack. Each channel offers 4-band full parametric EQ, variable high-pass and low-pass filters, gate, compressor and access to 4 DSP effects. Outputs have a 1/3-octave graphic EQ, limiter, delay and notch filters. Eight DCAs and 8 mute groups makes it easy to keep a handle on things. All of this is housed in a very compact package measuring just 3.5 x 14.2 x 11.7 inches (h x w x d) and weighing only 5.9 pounds. A cool zippered hard-sided bag holds both the mixer and the power supply, which is a "wall-lump" type. A standard IEC cord connects the power supply to an outlet. The mixer's metallic finish is attractive, and controls are all well labeled. My first impression when I unpacked the TouchMix-16 and put it on the test bench is that there's a lot of interconnect flexibility. Each of the 16 channels has a rotary trim, and the rotary knob is plenty big and has a nice feel. Pressing on a channel highlights that channel, and the large knob can then be used to adjust the volume. Pressing down on the knob prompts a "fine" adjustment mode. Further, any parameter can be adjusted by simply touching the parameter on the screen and turning the knob. I found this easier in fine-tuning things like EQ rather than trying to move my fat fingers around the screen. It also adjusts headphone and cue volume. Above the knob are a series of buttons providing a wide range of functions. They're very well-spaced and clearly labeled, so there's no confusion or chance of hitting the wrong button. These include user buttons, as well as a "zero button," talkback mic, assign to phones, an aux overview page, mute groups, the effects and gain wizard pages, topped off by an effects mute button that I think should be included on every mixer! Another button is simply marked "Info." Pressing it brings up an option screen where the user can select additional information on any function – no need for a manual when all of the information is available right on the mixer. To the right of the touch screen are three more buttons. 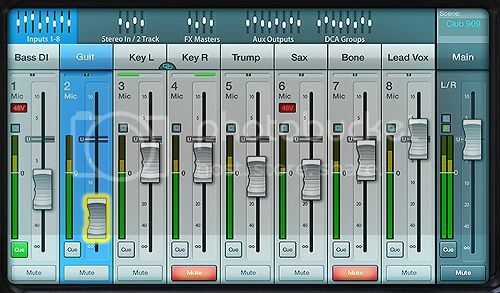 "Home" brings up the fader banks in 8-channel segments, and at the top of each bank are tabs to take you to the other faders banks for channel inputs, stereo inputs, FX masters, aux outputs and DCA groups. "Menu" provides access to pages to set up the general console settings as well as scenes, DCAs, and phantom power. (This menu also includes 2 overview pages for the aux and FX routing to view all routing for each bus.) And "Record/Play" brings up the built-in recorder functions including channel arming and transport controls. As noted earlier, these mixers are very well designed for both less- and more-experienced users. In "simple" mode, many functions are hidden and turned into basic controls. For example, in simple mode the channel EQ is a 4-band fixed frequency unit providing boost or cut at 80 Hz, 400 Hz, 2 kHz, and 6 kHz, along with a fixed low-cut at 120 Hz and a fixed high-cut at 8 kHz. If a channel preset is recalled, the frequencies and width of the filters will change under the hood but the simple, 4-knob operation is retained. In advanced mode, this EQ is now a 4-band fully parametric with optional shelving, with adjustable low- and high-pass. A wireless USB dongle facilitates use of an iPad for remote control, so I grabbed mine and downloaded the app to check it out. Setup is very easy. In the mixer menu there's a network section where you can rename the mixer and give it a new 10-digit password, then you simply connect the iPad to that network and the mixer links up on its own. Finally, with a mic plugged, I checked out operation and sonic quality. The mixer sounds great, and I was particularly impressed with the FX units. There are 4 slots, and the user can choose between a dense reverb, lush reverb, mono delay, stereo delay, basic chorus or pitch shifter for every send. The reverbs and delays have a ton of control parameters. Confident in it's capabilities, I added the TouchMix-16 to a system staged for a multi-day festival that would be loading in the next morning. At the festival we provided main stage sound reinforcement, distributed audio for the grounds, and audio for an outdoor movie and a tent, and distributed audio. The first day we used the TouchMix-16 for the movie system. The supplied Blue-Ray player only had RCA outputs, so we used a pair of adapters to plug them into the combo inputs on channels 15 and 16. The main outputs were linked to the loudspeakers, and I booted up my iPad to use the mixer to fine-tune the system in the listening area. Perfect. The next day we moved the mixer to the tent and used it to route theme music from a laptop to powered loudspeakers. It was easy to optimize EQ via the "touch and turn" operation provided by the touch screen and rotary knob. Fast, intuitive and accurate. From there we took the TouchMix-16 to a corporate event with presenters, video playback and live music bolstered with backing tracks. We were given very little setup time, so I decided to place the mixer next to the stage and mostly mix on the iPad. The music act had two different laptops with backing tracks, a keyboard with stereo out, keyboard module with stereo output, acoustic electric guitar and two vocal mics. They also required two monitor mixes for floor wedges and wanted reverb in their monitors. It's an application right in the wheelhouse of this mixer. When the musicians asked me for reverb in their wedges, I hesitated for a second and then remembered seeing FX sends on the aux overview page. Sure enough, one button press was all it took to take me to the right page where I could dial in any of the 4 effects to any aux bus. The artists were happy, the audience had a great time, my client was pleased – and so was I, impressed with the capabilities of this mixer, in addition to really enjoying mixing on it. Both TouchMix models are a perfect fit for a wide range of needs for rental companies, as well as smaller applications such as houses of worship and performing musicians. Based upon my evaluation, these mixers are highly recommended. One thing with the touch mix is with the XLRF connector and the press to release. The lip on the back of the touch mix almost covers the press to release on the XLRF. I feel a little more space between the lip or overhang or moving the connectors so more of the XLRF is exposed would help when trying to disconnet the XLRF. I'm holding off purchasing a TM-16 until two problems are resolved: 1) low output and 2) a power up issue. QSC identified the causes and the fix will be included in the forthcoming V2.0 firmware release. Even though both bugs affect very few units, V2.0 will include other improvements and new functionality. I've been impressed at how responsive QSC has been to customers' issues and suggestions regarding the TouchMix. Tom, I am about to purchase one of these but was unaware of the problems you mention. Can I assume the firmware on existing units will be upgradable and fix the problems or is waiting for a new release the way to go? Yes. I can't imagine a company putting out a digital board with no capability to update firmware. You can keep informed of the latest at QSC's forum. As I see it, it's just a matter of who loads the firmware: the user (existing owners) or QSC (on new units). I choose to wait. Keep in mind most owners are not experiencing the stated issues, so chances are excellent you won't either if you were to purchase now. I have not noticed this on my TM16. However, Chris Brouelette posted this on QSC's forum: Firmware V2.0 will be released Jan 22, 2015. I like my TM16, it works great for Ceremonies & Cocktail bands. I haven't worked with a Bar Band on it, but at first... it maybe a little slow like any other digital console setting up for the first time. My only issue with the supplied console is the USB Network thingy, it has a very limited range. However, that can be easily fixed with a WiFi Network box. Good news about the V2.0 release date. Thanks for the update. V2.0 includes "features" QSC claims will eliminate connectivity issues some are reporting with the wi-fi dongle. This seems to be the most reported problem with the TM-16. Another major problem with the unit is that the dynamics processing occurs immediately following the input, and is therefore always audible in the aux outputs. I mentioned this to a QSC rep who seemed incredulous at first, but then confirmed that this was indeed the case. I heard through the grapevine that this also might be something addressed in a new firmware revision. I hope it is, because compression in the monitors drives most singers nuts.